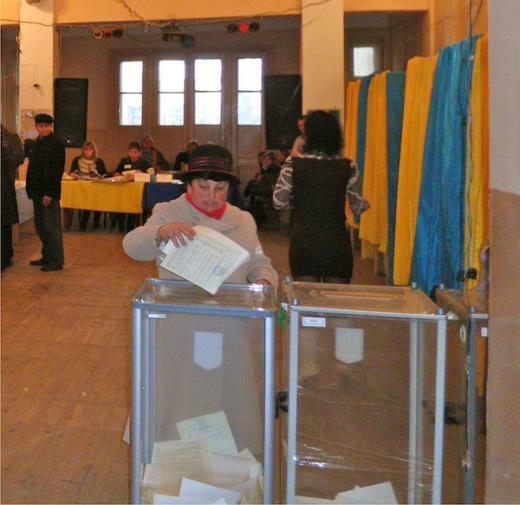 Photo from Russell Frank A polling place in Western Ukraine, October 2012. OK, I didn't actually stir up trouble in Ukraine. But things were calm when I got there and have been calamitous since I left, so my Penn State colleagues are blaming me. In fact, I spent my time in Ukraine the way every stranger spends time in a strange land: trying to understand and be understood. It was a challenge. It was also refreshing, after a year of all Sandusky, all the time, to go someplace where no one had heard of Jerry, JoePa or intercollegiate sporting events that draw 100,000 spectators. I could write a book about my time in Ukraine but for now I'll leave it at this: After observing its October 2012 parliamentary elections I was not surprised that this long-troubled land began to unravel. In the eastern part of the country, the ruling party of now-deposed Kleptocrat-in-Chief Viktor Yanukovych received 65 percent of the vote. In the West, where I was, his party captured less than 5 percent of the vote. In the East, the ultra-nationalist Svoboda Party picked up slightly more than 1 percent of the vote. In the West, Svoboda led with 38 percent of the vote. Those are some stark divisions. And now there are the imperial ambitions of Vladimir Putin, who might be mad. Loved ones tell me they're glad I left before Ukraine became a hot spot, but as one who still calls himself a journalist, I wish I were there, bearing witness. The standard question when you return from a sabbatical is, how does it feel to be back? The expected answer is that it feels none too great: Back to the rat race. Back on the treadmill. Back to the daily grind. Work needs a new publicist. 1. The Joys of Gainful Employment – During my year away I spent time with three friends who, like me, are at least halfway to 100. None of them has a steady income at the moment. I'm not just glad I have a tenured faculty job at this fine university. I'm glad I have any job whatsoever. 2. The Joys of Being Busy -- I am getting close enough to retirement age to see a sabbatical as a preview. My conclusion: not ready. Retirees extol the joys of not having to be anywhere at any particular time, but I still like the routines of work. I like having places I need to go and things I need to do. I also like the culture of work: the doorway/hallway chats with colleagues, the chance meetings with students around campus. As much as people complain about their jobs, I think a lot of them like those things about work also. It's just not cool to admit it. 3. The Joys of No Longer Living Among the Woo People – I enjoyed my 15 years in the frat zone, but I hold a higher opinion of Penn State students now that I'm not encountering them at their loudest and most loutish. The tranquility of life on the other side of town ain't bad either. 4. The Joys of Campus Life -- A snapshot from last fall: The lower half of the mall from Allen Street to Pattee Library is lined with blue balloons touting the Blue-and-White Bash. The upper half is lined with yellow balloons touting a marathon reading of Gabriel Garcia Marquez's "One Hundred Years of Solitude." After lending my voice to the Marquez marathon for five minutes, I head to a meeting of Penn State employees incensed about proposed changes to our health benefits that seem unduly invasive of our privacy. En route I bump into a former student who wants to talk about news coverage of a student who tweeted a racist complaint about noise in the HUB. All of it, the Bash, the Marquezathon, the uproar over the healthcare initiative and the uproar over the racist tweet, reminded me of what I love about campus life – not that it is a quiet island of peace and harmony, but that it is a noisy arena of struggle and conflict where people are trying to figure out what's right, what's fair, what's meaningful. Some weeks this column will be a quiet island. Some weeks it will be a noisy arena. Maybe some weeks it'll be both. As the oldest motel in Pennsylvania, The AutoPort at 1405 S. Atherton St. has begun to show signs of wear. 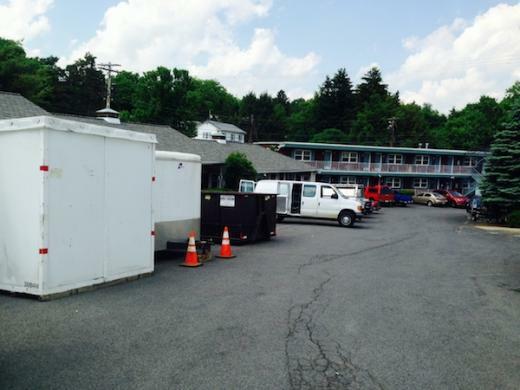 That’s why Anthony Melchiorri and the rest of the Travel Channel’s “Hotel Impossible” crew have started filming at the location, hoping to return the AutoPort to its former glory.